Got some time to spare? Help donate free rice by playing a simple word game. Be warned – it’s very addictive! 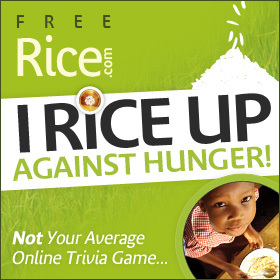 Click here or on the banner above to play Free Rice. Click to Donate – Easy Peasy! Donate to worthy organizations like the National Breast Cancer Foundation through The Breast Cancer Site. All you have to do is visit and click a button; you can do this every day to help provide free mammograms to women in need. Click on the tabs at the top to visit similar sites to help end hunger, child health, aid literacy, animal rescue, and the rain forest. Using a similar model, you can click once per day for additional causes through Care2, which uses advertiser money to fund organizations like Children International. It’s as easy as this: get moving. Bikers earn 10¢ a mile and walkers and runners earn 25¢ a mile, up to our initial $1,000,000 sponsorship pool. Download in the Apple Store or the Google Play Store. Visit their website to learn more! Got any other fun charity sites to share? Leave a comment or let us know on Facebook!